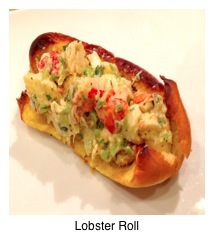 Lobster Rolls | Cooking Wine And Travel - The site where Foodies Unite! Posted on September 8, 2012. My wife Karen became hooked on Lobster Rolls several years ago when I took her to Boston for the first time. One of her friends had given her a list of the top 10 Restaurants for Lobster Rolls in Boston, and she made it our quest to hit as many of them as possible. The best Lobster Roll we found was James Hook & Co where they serve out of a trailer and you dine on a park bench in a parking lot near the wharf. While this may have been the inspiration for my Lobster Roll, I brought a little of my Cajun roots to this particular version. In a large bowl, mix all of the ingredients. Seal and place in refrigerator, allow to chill for at least one hour. Slice buns open and brush top and side with light coating of melted butter. Over-fill the buns with lobster mix and serve immediately.